Left: arctic sea moss from the low intertidal of Calvert Island shorelines, photographed by Sandra Lindstrom. 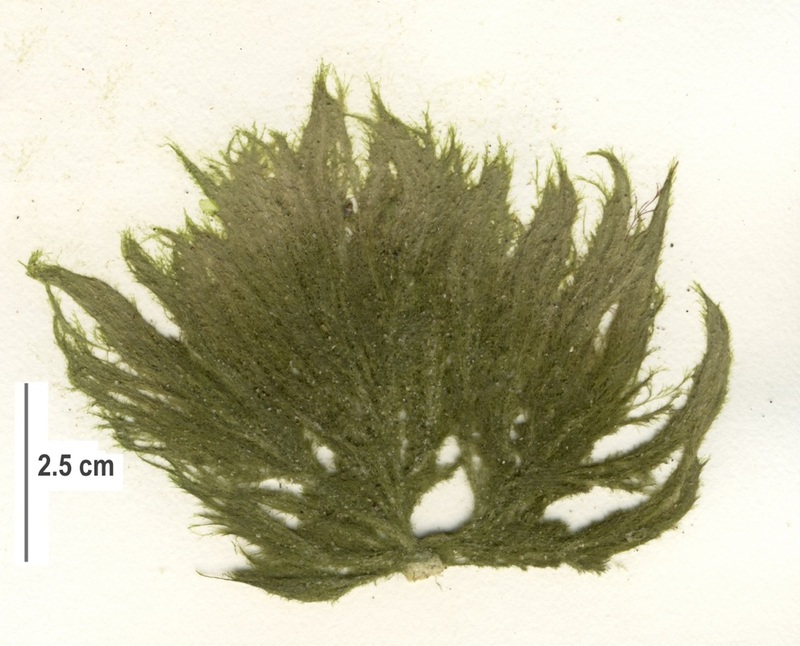 Top image is of specimen SCL 15381 in the UBC Herbarium Algae Database, bottom is specimen 14988. Search these specimens in the database for further details. Right: arctic sea moss (dark green) growing among red coralline algae and sea lettuce (lighter green) species. Photo by Joel White. 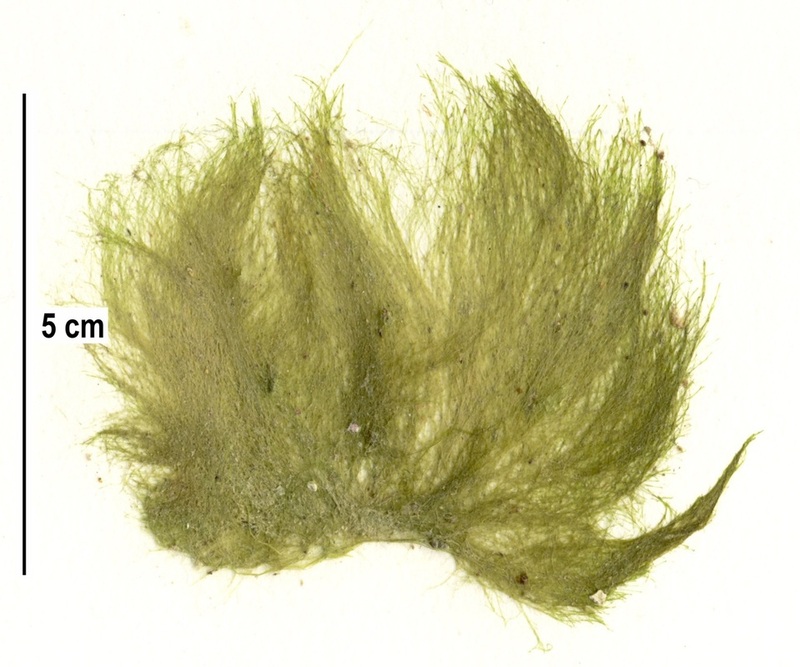 Arctic sea moss is a tufted green algae that forms dark green mats up to 6cm tall. The mats are composed of very fine, straight, branching filaments (rarely curved). The branches have rounded ends and do not taper. When filaments are pulled out of a tuft they pull their branches along with them, making the tuft messy and disorganized. Species of this genus hold water well, and can be wrung like a sponge to dry out the thallus. This species can be found on mid to low intertidal rocks and boulders in protected or semi-exposed areas. It is generally seasonal, and is only prominent in the spring and summer. In the Pacific Northwest its range extends from the Aleutian Islands to Oregon; it is also found in the Arctic Sea, on coastlines in the west Pacific (Russia, Japan, Commander Islands), the North Atlantic, Baltic Sea, North Sea, the coast of Chile, and subantarctic islands. 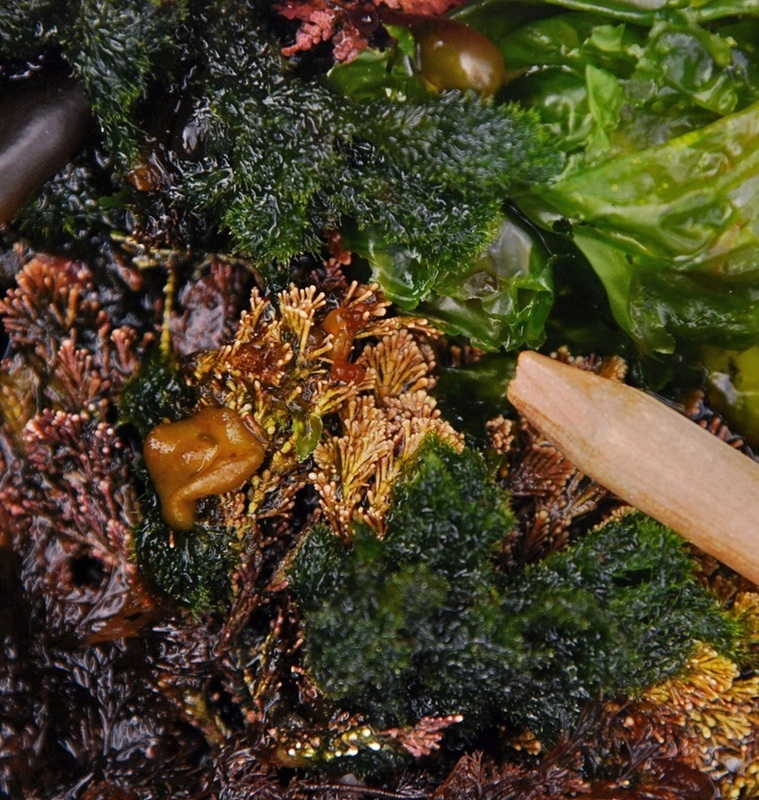 Arctic sea moss can be differentiated from other Acrosiphonia species by its low, turfy form. Both green rope (A. coalita) and northern green rope (A. duriuscula) form ropey strands not evident in arctic sea moss. Green rope can also be distinguished by its hooked branchlets, which require a hand lens to be seen clearly. The latter is not found further south than the Aleutian Islands. The form described above is the gametophyte stage of this species. The sporophyte is unicellular and lives in the tissues of some species of red algae. Lindberg, M. and Lindstrom, S. (2010). Acrosiphonia arcta. Seaweeds of Alaska. Accessed 13/11/2014. Guiry, M.D. & Guiry, G.M. (2014). Acrosiphonia arcta (Dillwyn) Gain. AlgaeBase. National University of Ireland, Galway. Accessed 13/11/2014. O'Clair, R. and Lindstrom, S. Acrosiphonia arcta (Dillwyn) J. Agardh In Klinkenberg, Brian. (Ed.). E-Flora BC: Electronic Atlas of the Plants of British Columbia. Lab for Advanced Spatial Analysis, Department of Geography, University of British Columbia, Vancouver. Accessed 13/11/2014.